Mango have some fantastic orange bits and pieces - simple t shirts and well fitting trousers all reasonably priced. This seems to quickly be becoming the way to work the 'bold' look, I have seen a lot of people around South Molton St doing it. Really like the colour here, for some reason it feels a bit of more wearable than the others. I'm going to buy these and wear them much as the model is here - with a neutral colour top and dark shoes. Would look great in summer with some high sandals too - ie: go to Aldo. Check at COS for some amazing orange pieces that annoyingly you can't put on here as all their advertising is through video - I popped into the store in Regent St last week and found some amazing dresses, cardigans and tops. 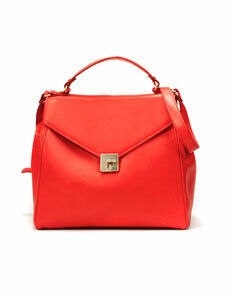 Love this Zara bag too - eek - goodbye pay cheque! Keep posted for our next colour of choice! think only the bag would work with my colouring.